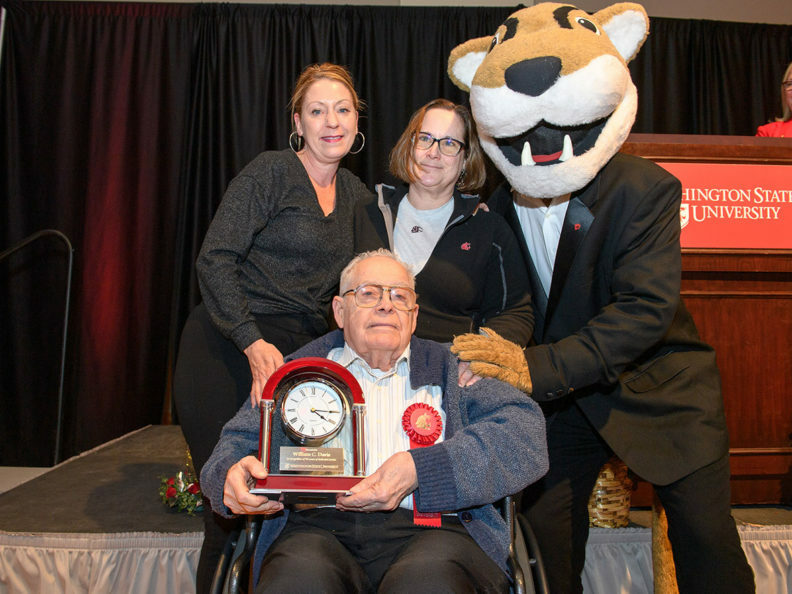 Despite the possibility of closure in Pullman, and campus closures at Everett and Spokane, the 14th annual Employee Recognition Reception was held as planned on February 12. The event was livestreamed to the WSU Tri-Cities and WSU Vancouver viewing parties. The reception started with a bang, with an exuberant Butch conducting a surprise performance of the Fight Song by the WSU Marching Band. Employees with 5 through 35 years of service were recognized in groups, and Crimson Spirit Award recipients, 40-year employees, and one 50-year employee were honored with tribute videos, awards, and certificates. William C. Davis, Ph.D., the 50-year honoree, was recognized with a standing ovation and was given a surprise round of “Happy Birthday” by attendees to end the celebration. The three tribute videos, first shown at the reception, are available below. Video tribute for William C. Davis, PhD, 50-year honoree in 2018. Video recognizing 14 employees who reached 40 years in 2018. Video honoring Crimson Spirit Award recipients in 2018.